In January of 2011, the City of Ballarat, Australia implemented an employee wellness program that included the services of other third party wellness initiatives such as QUIT (smoking), Weight Watchers, and a 10,000 steps challenge. It also included a 2 hour lecture by Professor Paul Taylor about wellness and motivation as well as a chance to participate in an 8-week wellness program I created using content produced by Paul Taylor. The program was used to measure how online and social engagement promoted lifestyle behaviors that lead to improved physical and mental health in this study through the creation of a website, email campaign, and FitBit activity monitoring devices. On September 3, 4, and 6, 2012 Paul Taylor spoke to 410 City of Ballarat employees in small groups of about 140 each. Professor Taylor promoted the study during these lectures. 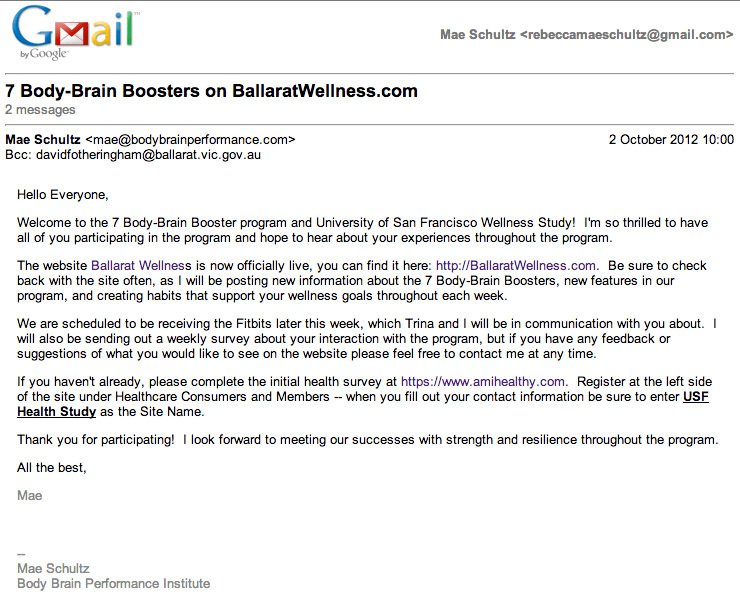 Emails of people who were interested in participating in the study were gathered at the lectures and during the next week at their workplace by Trina Keyte, the Business Excellence Co-ordinator and Garry Davis, the Executive Manager of Organisation Services & Development at the City of Ballarat. There were initially 137 employees who expressed interest in participating in the study, but only 108 employees completed the Study Subject Consent form (see Appendix) and initial SF-36v2 Health Survey (view sample HERE). Once study subjects had finished the registration and initial survey, they were considered a part of the study. The SF-36v2 health survey was administered through an all-in-one system called “Smart Measurement System (SMS)” which provided the ability to administer the survey via the www.AmIHealthy.com website. I provided subjects with instructions to set up a private login on the site to take the survey from any internet-accessible computer. Once subjects completed the survey I was able sign-in to the site, with a professional login, to access all participant data, respondent reports, and various aggregate reports. 107 study subjects received a Fitbit activity monitoring device (value of $120 AU) that they choose to use or not use throughout the study. The Fitbit is a health related product that offers independent data about the participant’s sleep and activity levels. Participants could choose to share this data with me or keep it private during the study. Each proceeding week, I emailed a 5-to-8 question survey about online engagement and motivation to each participant. The surveys were hosted on SurveyMonkey.com, but could also be accessed directly in the email. I scored these surveys and gave positive feed back to participants for completing each survey as well as motivational messages in response to survey answers. See Site Map for links to each survey. Each week of the study, content on the website focused on a different areas of mental and physical health such as nutrition, activity, socialization, etc. based on the 7 Body-Brain Boosters developed by Paul Taylor. Participants were encouraged to try some of the “challenges” listed in the content such as meeting with friends, walking 10,000 steps each day, and practicing meditation. Short educational videos and pictures were added to the website each week in addition to light hearted videos with the purpose of making participants laugh. Participants did not need watch them or try the challenges to participate in the study. After the final week of the program, participants were emailed a link to the final SF-36v2 Health Survey to complete online. The survey was also scored by a licensed QualityMetric professional through that Smart Measurement System (SMS) and compared to the original health survey of each participant. The content on the site remained online for participants to access after the program, but no further content or emails will be sent after November 25. The City of Ballarat employees range in ages from early 20’s – mid-60’s with a range in education level and a comfort with or access to new technology such as smartphone apps and social media sites. All participants we reached out to were over 18 years old. There was an even split of gender in the 400+ participants attending Professor Taylor’s lecture. Of the 108 subjects who participated in the study, 32 were male (33%) and 67% were female (66). The mean age was 41 with an age range of 22-61. After the 8 week program, only 54 subjects completed the final Health Survey. Of these 54 subjects, 15 were male (31%) and 33 were female (69%). The mean age was still 41 with an age range of 24-61. Employees of Ballarat also range in income level or family size. All employees can speak English fluently and had access to as well as familiarity with email. SF-36v2 Health Survey administered before and after the program to measure health improvement. Frequent short surveys and challenges throughout the program and a general analysis of online behavior through WordPress to measure site engagement.